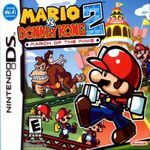 Mario vs. Donkey Kong 2: March of the Minis is the sequel to the Game Boy Advance game Mario vs. Donkey Kong, a follow up to the Game Boy Donkey Kong game, though it is more puzzle-oriented, now that the player controls several Mini Marios with the touch screen instead of Mario himself. The game also features the return of Pauline, whose last appearance was in the 1994 Donkey Kong game, a Game Boy remake of the original Donkey Kong. It features Nintendo Wi-Fi Connection. The DS Download Station Series 3 set of games features a short demo of the game. This is the sixth Mario game for the Nintendo DS. The name of the game is an allusion to the song "March of the Meanies" from The Beatles' album Yellow Submarine. The barrels in the game are an allusion to barrels." Source: Wikipedia, "Mario_vs._Donkey_Kong_2:_March_of_the_Minis," available under the CC-BY-SA License.